Beauty Bungalow LED Light Therapy | Supercharge your facial! Supercharge your facial with high tech skin healing. Red light stimulates collagen, antibacterial blue light heals acne and calms inflammation. Consider this your express ticket to beautiful skin. 30 minutes of LED Light Therapy can be added on to any treatment or booked alone in a series. We send light waves deep into your skin to trigger natural cellular reactions: Depending on the light, your skin responds differently. Red light strengthens the cellular structure and boosts collagen. 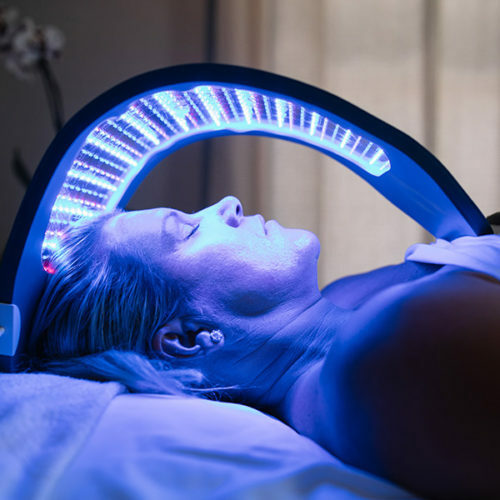 Blue light wavelengths stimulate the production of oxygen that eliminates acne-causing bacteria. LED Light Therapy is suitable for all skin types. LED Light Therapy helps to soothe inflammation from rosacea. LED Light Therapy calms acne and helps to stop breakouts under surface. LED Light Therapy stimulates collagen production for a plump bouncy skin. LED Light Therapy speeds up skin healing, a good option post-op. LED Light Therapy makes skin more radiant and resilient.